The topic for the August 2009 edition of the Graveyard Rabbits Carnival is: favorite photo. 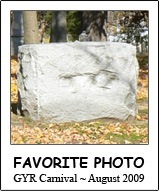 Choose your favorite cemetery-related photo and bring it to the carnival. Post the photo to your blog, along with a short description of the photo, where it was taken, and why it’s your favorite. These photos were taken just the other day during a tour of St. Joseph’s Cemetery, in Bloomington. Rain was on it’s way so I just began to snap photos without really paying much attention to what I was photographing. It wasn’t until I went back to the photos that I noticed something I hadn’t noticed when I took these two photos. Upon first glance, you see the a small statue of a child, one the backside of the headstone. But if you look closer, you can see that the child is cradling a bird. What I think is neat about this photo, is that there is dried-out grass around the bird, which looks like a nest. So it looks like the child is holding a nest with a bird in it. The headstone and statue belong to Robert Joseph Durst Dauber, who was born 11 October 1970 and died 7 May 1973. Julie That is a beautiful monument. You would think it was from long ago. I wonder if the little one had been fond of birds. It has such a gentle but sad feeling about it. What a sweet little statue!Thank you for sharing it with us! How perceptive - that little added detail makes a very good photograph into something truly exceptional; outstanding choice.